Extreme Tube Band Handle by Go Fit at Bodybuilding.com - Best Prices on Extreme Tube Band Handle! Get effective strength training at home or anywhere with GoFit's Rubber Resistance Training System. 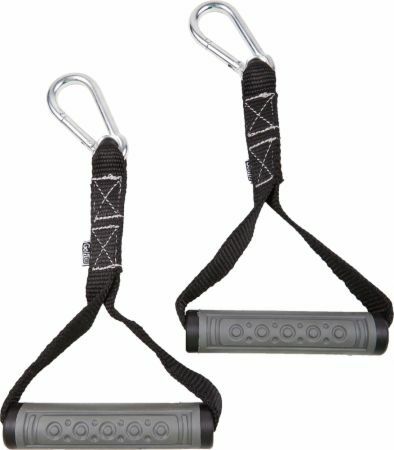 A key element of this portable weight-resistance system are the GoFit Power Handles. As your training progresses, simply expand your system with more resistance options. For example, use one pair of Handles with as many different Tubes or Bands as you may require. Included with GoFit Power Handles is the GoFit Power Tube Training Booklet. You’ll get proper usage instruction, and a detailed, progressive workout guide. Several exercise options are included, with pictures showing correct step-by-step usage. This expandable workout guide helps you get the most out of your GoFit Power Tubes to reap real fitness benefits. The GoFit Power Handles are made of heavy duty, premium components. Durable handle grips have smooth rubber texture with traction pattern, so you keep your grip during exercise. The composite grip surface feels tacky to-the-touch, giving you a secure grip and added control. The nylon webbing, stitching and connecting-carabineer have all been upgraded providing optimal performance. Maintain your grip while having freedom of movement with the grips' rigid, tubular design.